Cádiz is often overlooked in favour of nearby Seville, but this is a city that no traveller to southern Spain should pass over. 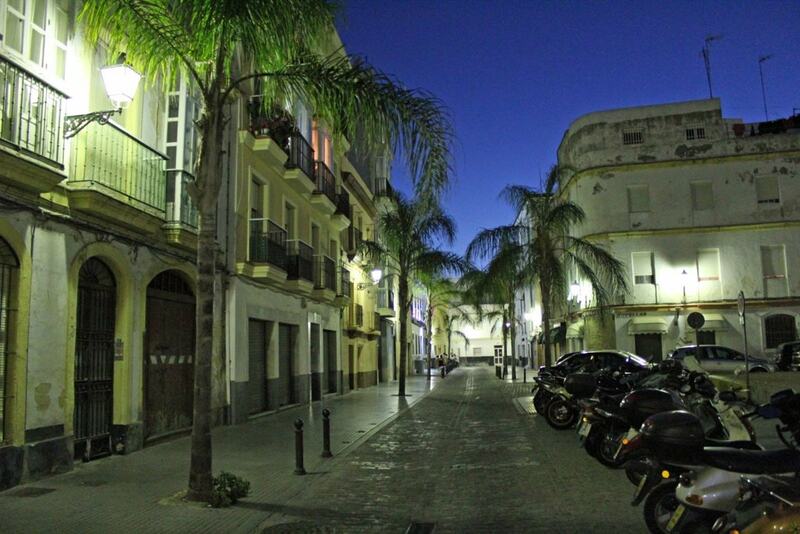 Read on for 11 reasons to visit Cádiz, Andalusia’s most underrated city. Unaccountably, Cádiz’s oldest quarter is rarely named as one of Andalusia’s most beautiful barrios. Yet this maze of shabby-chic streets that surrounds the city’s great cathedral is every bit as enchanting, in its own unique way, as Seville’s Santa Cruz or Córdoba’s San Basilio. It’s packed with old-school tapas bars and boutique clothes shops and is home to some of the city’s most beautiful buildings. La Viña is Cádiz’s old fishing quarter and occupies the south western tip of the city near the La Caleta beach. It has resisted the passing of time admirably, populated as it is with elegantly crumbling buildings and tapas bars that have been going for generations (check out Casa Manteca, a local legend). The local fishermen still moor their boats on the barrio‘s stretch of coast, immediately next to Santa Catalina castle. About halfway along the waterfront thoroughfare of Avenida Campo del Sur, a colony of lazy wild cats lives amongst the huge manmade boulders piled up against the sea wall. Maintained by a local collective called Cádiz Felina, they doze and sunbathe on the rocks by day, undisturbed by the seagulls who come and go. Wild cats are usually treated as vermin elsewhere in Andalusia, so this little gang is a touching and unique aspect of Cádiz street life. 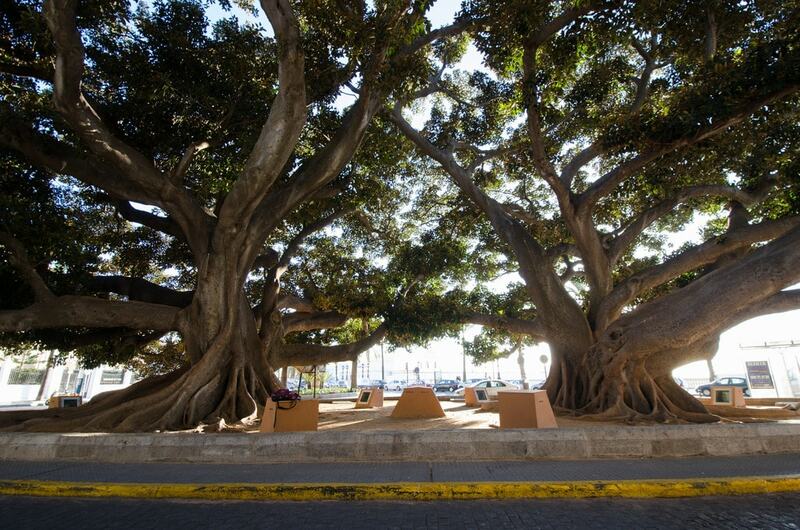 No visit to Cádiz would be complete without visiting two of its natural marvels – namely, the couple of gigantic old rubber trees that grow outside the the university’s Economics faculty near Playa Caleta. These marvelous instances of the ficus macrophylla species are over a century old and provide a huge canopy under which you can enjoy some shade if you’re visiting Cádiz in spring or summer (or autumn, for that matter). The people of Cádiz are known throughout Spain for their thick accent – said even by other Andalusians to be hard to understand – and their fondness for cracking jokes or making witty remarks. They have thus earned themselves the (ever so slightly sarcastic) nickname of graciosillos – people who try to be funny. This is a great city, then, in which to improve your Spanish by getting involved in some witty bar-room banter with the locals. 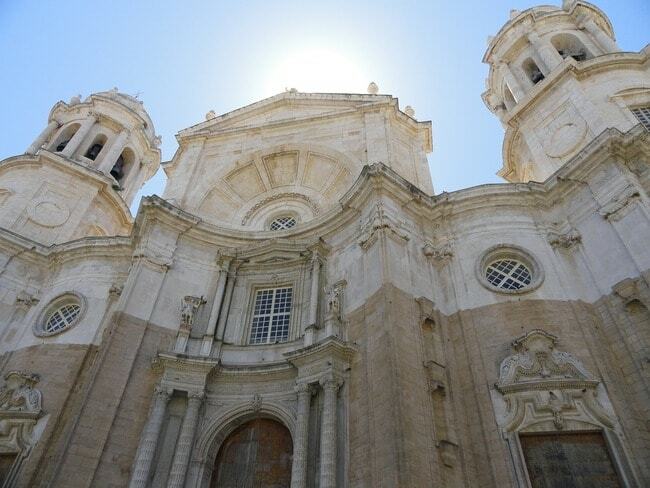 Started in 1722 and not completed until 1838, Cádiz’s huge Santa Cruz cathedral was originally known as the ‘Church of the Americas’, financed as it was by money from the ‘New World’. After admiring its façade from one of the sunny terraces on Plaza de la Catedral, take a stroll around the grand interior before climbing up the Levante tower for some spectacular views over the rooftops of Cádiz. Compared to Andalusia’s other Christian castles, Cádiz’s is fairly understated, but it still makes for an intriguing visit. Its construction was ordered by a defence-conscious Philip II in 1596, a year in which the city was sacked and temporarily occupied by Dutch-Anglo armies. Nowadays, its interior spaces are used to display the works of local artists (admission free) and during summer the internal courtyard is a stage for open-air concerts. Cádiz’s February carnival is the most famous celebration of its kind in Spain. Its stars are the wandering bands of street artists known as comparsas or chirigotas, who perform musical skits satirising Spanish current affairs and Spanish celebrities. As well as attracting huge crowds on the streets and squares during Los Carnavles, these groups also take part in a formal competition that’s held in the Teatro Falla. Plaza Libertad is home to the colourful and chaotic Mercado Central, Cádiz’s biggest food market. The speciality here, as it is throughout the city, is fish. The catches displayed along the seafood stalls in the centre of the market are so fresh out of the water that some of them – such as the crabs and lobsters, for example – are still moving. Join the locals in the surrounding tapas bars and watch the local life play out. 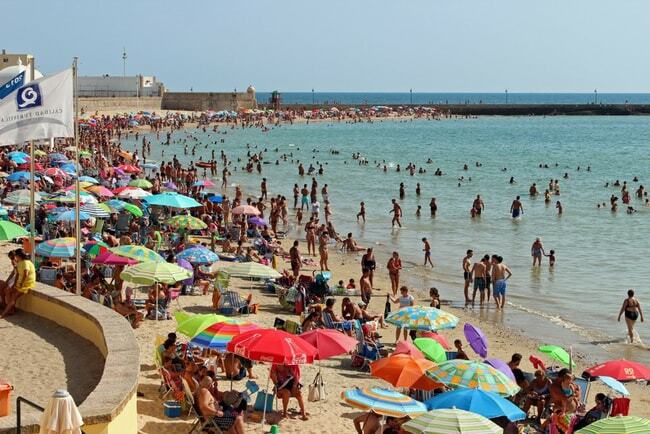 Cádiz boasts two of the best city beaches in Andalusia and for this reason is very busy during the spring and summer. The smaller of them is Playa La Caleta, a curved stretch of clean yellow sand just next to the Santa Catalina castle. The shelter provided by Santa Catalina means the bathing here is tranquil, and there is a great little chiringuito towards the beach’s western side if you fancy a cold caña (small beer) and a tapas of fresh fried fish. The largest of Cádiz’s two beaches is the Playa Victoria, which stretches away – seemingly into infinity – on the thin stretch of land that is the city’s eastern extremity. This is a vibrant and colourful scene in summer, with sunseekers enjoying beach tennis and kite surfing as well as swimming in Victoria’s pristine blue waters. Despite its size and popularity, the beach is excellently maintained and is always clean.